The morning of November 8, 2017, the parking lot at Red Mountain Community College was filled with those of us anticipating the trip to Guaymas for the Hearing Aid Project. As I had never been there before, I was unsure what to expect. Several Rotarians from our club met us with breakfast items that were welcome at that time of the morning and a great way to see us off on our journey. The journey ended up being a long one, especially for those on the bus. The bus was stopped at the border for three long hours, initially being told that new paperwork was not filled out and therefore, they would have to return home. 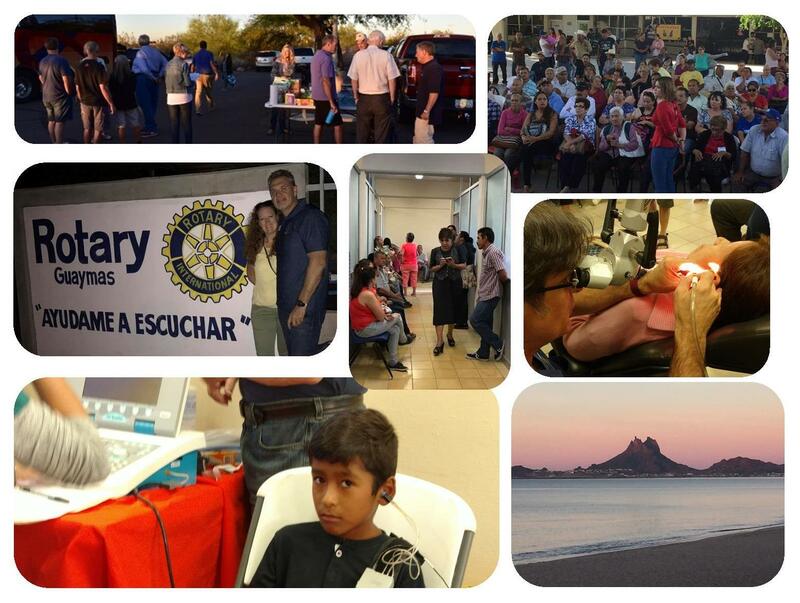 Luckily, our Guaymas Rotarian friends were able to procure an email that allowed us all to continue. November 9, brought us all together at the school where we were to conduct our clinic for the next two days. Day one was for children and day two was dedicated to adults. As we arrived, the courtyard area was already full of children and their parents and grandparents waiting for the clinic to begin. We set up as quickly as possible. The process was that the individuals seeking treatment first went to an intake area. They were asked for information such as name, etc. and files were pulled from last year or new files were created with the issues they were seeking treatment for. A new process was added this year as we are seeking Global Grant money from Rotary International. Additional questions were asked to better identify the needs of the community in the hopes that we can use this information for the Global Grant. After intake, the patients were shown to either the ENT doctor or to the initial screening areas. Doctors and Audiologists worked to diagnose the issues so that proper hearing aids could be issued. We had two Audiology stations that tested patients hearing in somewhat soundproof environments. We are fortunate to have these testing areas, however, this is where most of the time is spent waiting as most patients need these tests and with only two stations, this takes much time. As you can imagine, the cost of these stations are immense as they need to be as soundproof as possible, and building them is not only costly but prohibited by space. We were told of a new invention that allows the audiologist to test the patient without the need for the soundproof booth that only requires some advanced headphones with other equipment. We are going to look into that as that would help this process tremendously. Several of the audiologists spent two whole days in these dark, cramped spaces in order to serve all of the people that came for help. They never complained once and were as attentive and caring at the end of the twelve hour day as they were at the beginning. Once the patient has completed the testing, they move on to the hearing aid area. Three people spent the two days fitting patients with new hearing aids as well as repairing hearing aids that were given in the previous years. Translators were used so that the best fit could be made. Sometimes, the patient only spoke in sign language so that had to be translated to Spanish and then to English. Did you know that Mexican sign language is different that American Sign Language? Neither did I until this trip. After the hearing aids were adjusted, the patient then went to get new ear molds made. Three individuals spent the two days filling ears with the material that becomes the ear mold, drilling a hole in that mold and finally, attaching the hearing aid to the mold and completing the process. This is where you get to see much of the magic. I know of at least two children that heard for the first time after this process was completed. I watched them look in wonder at hearing for the first time and their mother’s tears being shed for the miracle of hearing. The ENT doctors worked the two days treating patients with many various hearing issues. Tubes were inserted to drain fluid, medicine was prescribed for ear infections and there were even some objects removed from the ears of children that somehow managed to place them there. I witnessed a small bead extracted from a little girl’s ear. Imagine the pain that she must have been in with that in her ear and no medical care to remove it until we arrived. The most amazing thing was the people, both the ones that served and the ones that we served. Some of them waited all day to see someone for their hearing issues. Children waited in cramped areas for hours and were still so well behaved. (Sometimes better than the adults). One child and his mother were there all day on Thursday and then had to come back on Friday morning to complete the process. Many came from many miles away in order to seek treatment. Due to the large demand, we can only give one hearing aid per person. There was no complaining. The volunteer staff was absolutely amazing. They worked tirelessly for two twelve hour days. Some didn’t even eat lunch and barely had time to take restroom breaks. They gave not only the gift of hearing, but they gave of themselves. They were compassionate and loving to a group of strangers simply because they knew they had the skills that these people needed. It was a true example of service above self.